Who can you reach out to for assistance? Core Services of the Ottawa Methods Centre (OMC) include consultation and advice, study design and methodology, statistical analysis, data management, systematic reviews and knowledge synthesis, health economics, and education. Trainees and early career members from the DoS are entitled to some services at no charge. For unfunded projects, these services include methodological consultation, statistical support at the project development phase, advice on data collection options, guidance on how to run statistical analysis, and 15 hours of statistical services per project. All other DoS members are also entitled to unlimited consultations and reduced OMC services fees for their projects. Please connect with Julia Chehaiber, OMC’s Operations Manager to confirm eligibility and service options. The University of Ottawa Library has renewed financial support for open-access publishing. Papers submitted on or after May 1st, 2017 are eligible for support with particular publishers or via the library shared support scheme (50% of article processing charges are supported). The exact support depends on the publisher. The details and procedure to access are posted at uOttawa (https://scholarlycommunication.uottawa.ca/uottawa-initiatives/financial-support). What are the internal sources for research funding? 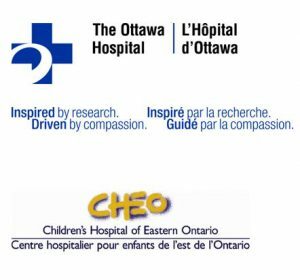 In partnership with the Faculty of Medicine of the University of Ottawa, the Department of Surgery is pleased to announce the competition for the 2017-18 Research Program Awards. Note: The same project should not be submitted to both the RPA and JFRG competitions, and that only one award will be made per person. 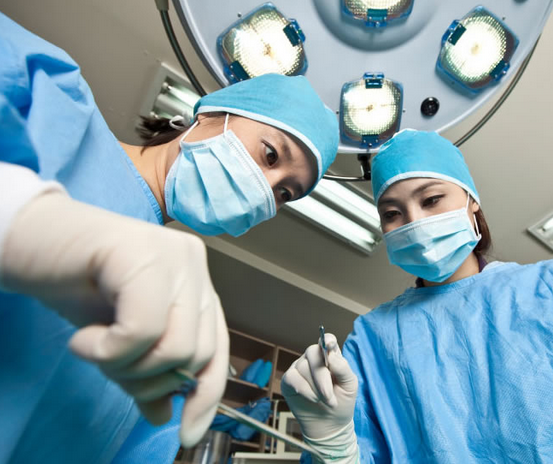 In partnership with the Faculty of Medicine of the University of Ottawa, the Department of Surgery is pleased to announce the competition for the 2018 Junior Faculty Research Grants. Note: The same project should not be submitted to both the RPA and JFRG competitions, and only one award will be funded per person. Description: Researchers compete for $20 k for their research project in the Wolves’ Den (i.e., protocols are pre-screened, ranked, and critiqued live by the surgical wolves [experienced researchers]). Be submitted as a single paragraph. Articulate how they will lead to high-impact publications and/or further grant funding. TOHAMO is pleased to announce the competition for Year 10 (2017-18) of Innovation Funds. Innovation Funds are awarded to TOHAMO physicians to support the development of new and innovative approaches to healthcare delivery and to provide leadership in the dissemination of new knowledge across the healthcare system. 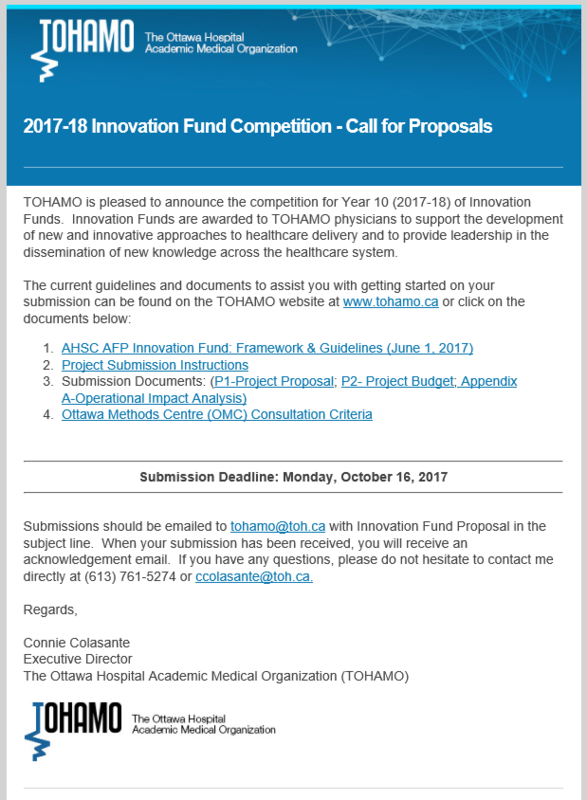 Submissions should be emailed to tohamo@toh.ca with Innovation Fund Proposal in the subject line. When your submission has been received, you will receive an acknowledgement email. Questions: Connie Colasante (613) 761-5274 or ccolasante@toh.ca. The Joan Sealy Trust is a uOttawa fund created to support translational cancer research, which is to enhance the translation of discovery into improved clinical management of cancer patients. Total Funding Available for All Projects: $200k. Only 1-Year Projects will be considered. Most funded projects are in the $25-$50k range. (It is not necessary to sign up for DropBox in order to view this url. If you want to Print, go to Download – Direct Download – Open). Include a brief CV for each investigator. Queries: Lynn Crosbie (lcrosbie@ohri.ca, 613-737-7700 x70343). The Department of Innovation in Medical Education (DIME) is pleased to announce a call for proposals for the DIME Health Professions Education Research Grant 2017/18. 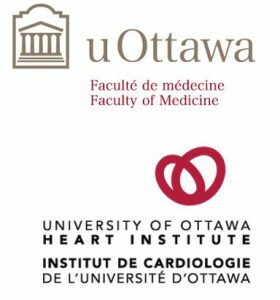 The goal of this research grant is to support projects that involve scholarship in health professions education within the Faculty of Medicine at the University of Ottawa. Value: The maximum amount that will be provided per project is $20,000.00. Duration: Projects must not extend beyond a three year period (i.e., December 2020). Deadline: Monday October 23, 2017 at 23:59. Confirmation of submission will be acknowledged within two business days; please contact the office if you do not receive confirmation within this time period. Late applications, paper submissions and incomplete applications will not be considered. Submissions may be made in either French or English. Training and mentorship in curriculum, teaching, and learning. Initiating, designing and conducting innovative research relevant to the field of health professions education and practice. The Foundational Elements of Applied Simulation Theory (FEAST) curriculum is a special series of small group sessions developed by the Department of Innovation in Medical Education (DIME) and the University of Ottawa Skills and Simulation Centre (uOSSC). 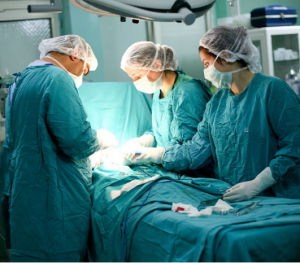 Enrolment is limited to those applicants who have been accepted into an existing Fellowship (with a substantial time commitment to simulation) for the upcoming academic year. FEAST sessions (with limited exceptions) will be held on Wednesdays between 8:30am – 12:00pm and the course will run from July 2018 to June 2019.